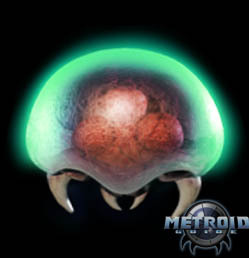 This particular Metroid strain is based of the transplanted Zebes strained Metroids evacuated from the fall of Zebes. It was observed that the infant Tallon Metroids took longer to progress into adult form than their Zebes counterparts. Once in adult form, they were also less aggressive. These results were analyzed by the Space Pirate High Command and deemed untolerable. All adult Tallon Metroids from their first batch groups were liquidated and a new variable was added to their growth: Phazon. When the infants were exposed to Phazon they almost immediatly reacted to this new pathogen. As Phazon itself is inheritly unstable, this too effected the overall behavior of the Tallon Metroids. It increased their overall size to that slightly larger than the Zebes strain. They became ravenous and extremely easy to provoke. It was often observed that they would fight with one another in a sort of show for dominance. As well as obtaining the "lifeforce" of other organisms, they were also permenantly addicted to Phazon as well. Without a constant source of Phazon, the Metroids would become extremely sick and eventually expire. Like their related strains, Tallon Metroids have an extreme hatred of the cold. This was exploited by Space Pirate scienists who used the polar regions of the Phendara Drifts to house their main Metroid containment facilities. 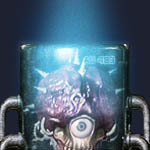 Even though confined by the cold, Tallon Metroids, as with all Metroids, possessed a high level of brain activity. This was including but not limited to problem solving. During early stages of the containment area's construction, a group of several adult Tallon Metroids escaped by observing the changing of posts between Space Pirate keepers. Before they were subdued they had managed to devour serveral staff members as well as almost escape underground through means of the base's geothermal heating ducts. The mistake of underestimating these creature's thinking awareness was not to happen again during the duration of the Space Pirates occupancy of Tallon IV. 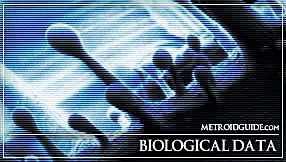 All escaped Metroids were believed to be pacified, though the later appearance of Fission Metroids only confirmed the successful escape of a small batch of Tallon Metroids escaping and later coming in contact with the Metroid Prime.